This Professional Mini Ball Head is the perfect accessory to add versatility to any tripod. Made from a lightweight yet incredibly strong aluminum alloy, this locking ball head makes adjusting your camera to nearly any position quick and easy. -Simply loosen the knob, and rotate, tilt and pan your camera or camcorder with complete fluidity. And when a 90-degree angle is desired, simply lower the platform into the notch. -This ball heads can withstand heavy loads, lock solidly, and move smoothly. Aiming and horizon leveling can be accomplished as one instinctive motion, and rigid lockup takes just a quick twist of one control. 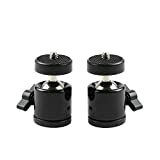 -Using this tripod ball heads are also much easier to carry and pack than tripods with pan-tilt heads no long, protruding screw the tripod ball head on your tripod. Then screw the whole tripod set to your camera.